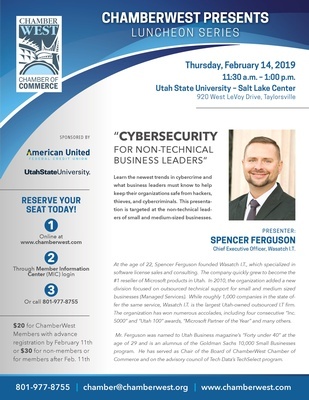 "Cybersecurity for Non-Technical Business Leaders"
Learn the newest trends in cybercrime and what business leaders must know to help keep their organizations safe from hackers, thieves, and cybercriminals. This presentation is targeted at the non-technical leaders of small and medium-sized businesses. This is on the east side of the building and use the east entrance where the patio is. Room 156 B is just to the right as you walk in from the east entrance. 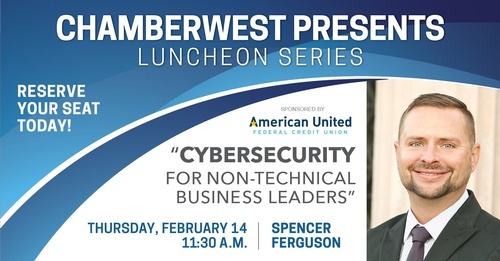 $20 for ChamberWest Members with advance registration by February 11th or $30 for non-members or for members after February 11th.